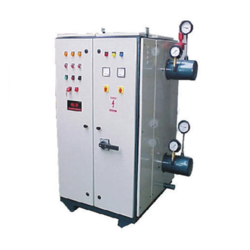 We are engaged in offering a wide range of Steam Boilers with various capacities. These can be run by gas, firewood with water inlet, outlet, water level indicator, float unit and safety valve. The inner body made out of 304 grade 14/16 SWG SS sheet and outer body in mild steel sheet. We offer latest economic gas model and electric model steam generators as per client's requirement. M/s Utech Projects Pvt. 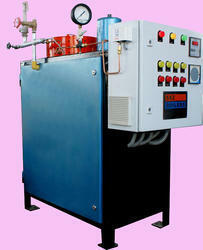 Ltd.
We offer a variety of electric steam boilers. Electric boilers are widely used in different industries owing to their efficient functioning, high energy efficiency, easy installation and low maintenance. These Boilers can also be customized as per the client's requirements. Product Name : Steam Boiler Capacity : 5kg / Hr to 20 Ton / Hr Pressure : 1kg / Cm2to 20 kg / Cm2 Fuel : Wood, Coal, Lignite, Diesel, LDO, FO, Bio-Mass, Husk, Bio gas, Pet-Cook Fired, Electrical Boiler. Our customers can avail from us a range of Electric Heated Portable Boilers in both portable (3kw) & automatic (6 to 18kw) categories which is an array of electronically controlled boiler with an indication for minimum / maximum water levels. - Shell and Tube type. - Airpreheater for better efficiency.